Kristy changed my entire image. I despise shopping so when I was forced to go because of an event or simply because I had nothing to wear I would just buy everything that fit. Can you say recipe for disaster? The first thing I did was have Kristy do a closet remix and that went so well I hired her as my personal stylist. It has been about a year now and I have not step foot in a store and couldn’t be happier. Not only do I have amazing outfits but the shoes and accessories she purchases just make everything pop. My favorite days now are those when I look out the window and see Kristy walking up my driveway loaded down with shopping bags! I recommend Kristy as a stylist to anyone who wants to look amazing! Each morning, billions of women get up on the morning, look in their closet and either say "I've got nothing to wear!" or "I've got nothing to wear that I look great in!". So, they try to correct that problem by going shopping -- either to stores or via the Internet. I've done it all, but my problem was that I kept making the same mistakes. I'd buy clothing based on colors that I liked, or because that fleece sweater looked warm. Being a petite woman, sometimes I just bought clothing because it fit! Or, like I am sure some of you do also, purchase one element of an outfit, never to complete the look and that item just gets pushed to the back of the closet. Of course, these shopping trips always resulted in my still not feeling like I had anything to wear that made me look great. Mostly, I felt frumpy. Kristy changed my perception and helped me see that I had some things that did look great on me; I just needed assistance to pull things together. Kristy spent 3 hours with me at my home going through my dreaded closet. I was impressed at how sensitive she was when telling me I'd been picking out pieces that were wrong for my body type or that I needed to tuck shirts to enhance my waist. She showed me how to take one (black) pencil skirt, and combined with scarves, necklaces and belted cardigans. I was amazed that one skirt afforded me more than 3 completely different looks. Talk to her about one of her suggested staples (shirt dress) and see if you can count how many different ways you can polish your look. Kristy had me model everything in my closet. We probably eliminated 70% of what I had and she gave me a shopping list of things to buy. I happily took her advice and am quickly adding the right things to my wardrobe. I plan to have Kristy take me shopping in the spring to help me add seasonal items to my cache. I loved how sensitive she was about what items did not enhance my wardrobe. She was so very positive and happily took pictures of each outfit that we put together, which really helps me in the morning. Now I just go to my 'Kristy book' and pick out a photo and dress for the day. It takes minutes and I walk out with a smile. I've recommended Kristy to friends knowing that she can help them also. Give her a call; you'd be amazed. "Kristy has been an AMAZING addition to my 'clothing life' She is a great balance of very professional yet fashion-forward. She is practical yet fun as she helps. She lets me have my own style but helps to refine it, make it more consistent, yet also help to keep it current in an age-appropriate way. She is also very pleasant and personable. I would HIGHLY recommend her to anyone of any age. We started working on just closet organization and 'outfit making' from my current clothes. Now, I trust her with virtually 100% of my personal and work wardrobe including shoes, accessories and clothing. She is even helping me with my outfits for my wedding weekend and honeymoon." I always thought I sported an original and classy style in my wardrobe, but I knew that finding something for my wedding required raising the bar and spending some serious time researching and plowing through the vintage racks. Unfortunately, I had so many other aspects of the party to plan, that I neglected the wardrobe part, half expecting it to just work itself out. I was in luck. Enter Kristy, who I had known for awhile through friends, but whom I'd never dealt with professionally. At this point it was three weeks before the wedding and all I had was my trusty pocket watch, which I've owned for years. The rest was just a concept and I hadn't looked at a single garment [Panic!]. 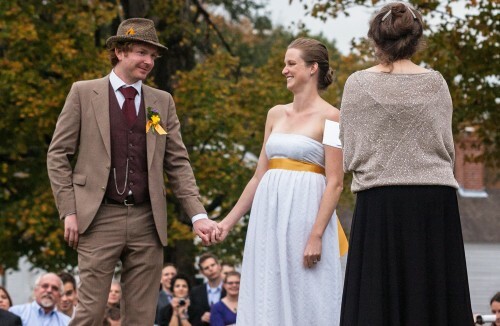 Kristy and I talked it over: it was an autumn wedding on a farm in New Hampshire. She quickly grasped the look I wanted and ran with it. Within two days we had a collection of possible looks and accessories and hit the vintage houses. Kristy's network of colleagues, access to old collections and most importantly, her sense of style, pulled together the perfect outfit in less than ten days. I got the pants tailored, and we were good to go. It was a wonderful experience, and I couldn't be happier with the outcome. No matter how narrow your vision, I'd trust Kristy to fulfill it. Kristy has absolutely changed my life. After 3 pregnancies, my wardrobe was basically empty – I literally had 2 pairs of jeans and 3 sweaters to my name. I started with Kristy about a year ago, and each season, she has helped me to fill my wardrobe, including shoes and accessories. I used to dread getting ready for work, or putting myself together to go out. Now I have such great outfit options, I enjoy the process! And I never even need to step into a store. Kristy has a real knack on picking out flattering styles for my particular body type, while at the same time, working on filling my closet with both classics and items that are "in" for each season. I am so happy I found her!